Eating Ice Cream in the Ice Cream capital of the World! Blue Bunny Ice Cream is made in the tiny town of Lemars, Iowa. More ice cream comes from this town in one year than anyplace else in the world. The Blue Bunny Ice Cream Parlor is part company history museum, part nostalgic soda fountain. Kids will love the massive sundaes that include gummy worms and loads of sauces and whipped toppings. 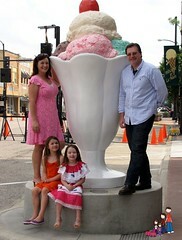 Visit during the annual Ice Cream Days celebration held in June. A free "Cone"ival, parade, music and other activities are a perfect Midwest festival for families.